Edward married Elizabeth Agnes McKeown (1871-1942), the daughter of James McKeown (1823-79) and Mary McAdam, at Ballarat in 1892. The Australian electoral rolls show that they farmed at Lalbert and then Meatian before retiring to Swan Hill sometime before Elizabeth's death there in 1942. Edward died at Swan Hill four years later, his death notice, published in the Melbourne Argus on 16 November 1946, telling us he was 'the loved father of Edward (deceased) Ethel (Mrs Bish, Swan Hill), Reginald, Edmund, Ida (Mrs W. Power) and Phoebe (Mrs J. Power), aged 79 years'. Their eldest son, Edward, died at Whycheproof as an infant aged just 5 months and three weeks. His heart-broken mother wrote, and published in the local newspaper, the following ode: 'How often I weep for baby dear, Taken from all who loved him here; To that beautiful home of peace and love, Which God has prepared for him above./ I shall always think of baby, Though I live to our old age; And I will never forget the parting, By his sad and silent grave./ I stood around him weeping, For I knew his end was nigh; And I know that darling baby, in the sad cold grave must lie'. Thankfully Elizabeth and Edward's other five children (pictured below on the left) all grew into adulthood and provided their beloved parents with new babies over whom they could fuss and smile. 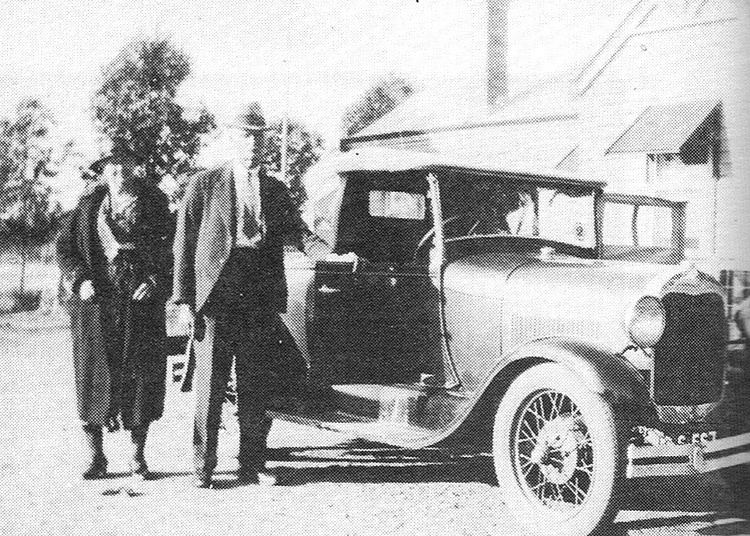 Edward ('Ted') Shepherd (1867-1946) and his wife Elizabeth Agnes McKeown (1871-1942) with their 'A' Model Ford motorcar. A very pretty wedding was celebrated at St Mary's Church, Lalbert on 2 April, the contracting parties being Miss Ethel Shepherd, eldest daughter of Mr and Mrs E. Shepherd of Mumbel Plains, and Mr F. C. Bish of Meatian. Rev Father Conway officiated. After the ceremony an adjournment was made to the Lalbert Hotel, where a sumptuous wedding breakfast had been set. The happy couple left by the morning train amidst showers of confetti and good wishes en route for Bendigo, where the honeymoon was spent. The bride, who was given away by her father, looked very pretty, and was dressed in cream sura silk bodice neatly trimmed with creme silk lace and orange blossom, and white shoes and stockings. She wore the usual wreath and veil and bouquet of waxed flowers, with streamers and was attended by Miss Mary Clarke, Melbourne, cousin of the bride, who wore a dress of pale blue crepe de chene, trimmed with pale pink Georgette, and carried a bouquet of pink roses, with streamers, and wore a charming black pamne velvet hat trimmed with pale pink silk and flowers. The bride's travelling dress was of a brown shot silk trimmed with pale brown Georgette and brown stitching, and wore brown crepe de chene hat to match, and handsome coat, gift of bride's brother. The report also listed those who gave the young couple wedding presents. These included Ethel's parents, grandparents and four siblings as well as Mr and Mrs Ryan, Mr and Mrs Whelan, Mr and Mrs S. Free, Mr and Mrs J. Free, Mr and Mrs J. Hickmott and Mr and Mrs Hasty (all of whom were related through the Shepherd line). Fred Bish was the son of Henry Bish (1856-1934) and Emily Ann Sargent (1862-1903) who were married in 1882 and lived in Melbourne and Alexandra before farming land at Mumbel Plains near Lalbert. We get a sense of Fred's childhood from a letter, written at Mumbel Plains to 'The Children's Column' of the Melbourne Leader in October 1901, in which the then eleven year-old told his readers that: 'We went to two picnics one on the 21st of August and the other on the 4th of September, We have 3 cows 4 calves a dog and a cat we have 9 horses. We go to school my Brother is In the first class my Sister is in the fifth class and I am in the fourth class the teacher's name Is Mr Adams there are 32 children going to school'. 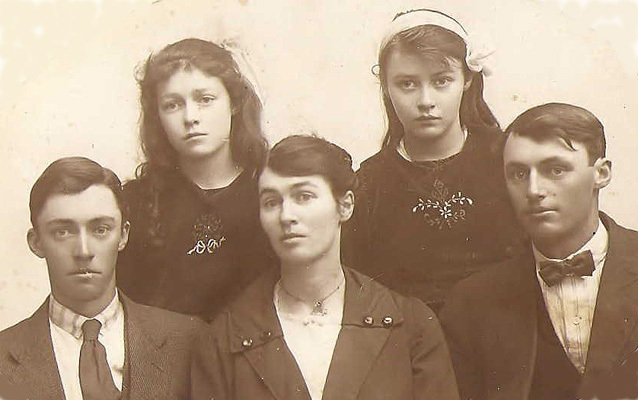 According to the 'Bish Family Tree' on Ancestry, Fred had seven siblings in total: Rose Emily (1883-1915), Henry (1885-1958), Beatrice Maud (1888-1966), John Thomas (1894-1974), Olive Isabella Mary (1897-1920), Stanley Harold (1900-1925) and Albert Arthur Bish (1903-1976). The brother Fred mentions in his letter may have been John Thomas Bish who, according to his military record in the Australian National Archives, was born in the Melbourne suburb of Footscray and enlisted in the First AIF on 22 February 1916. He sailed to England on the THEMISTOCLES on 28th of July as part of the 19th Reinforcements for the 37th Battalion. John suffered a serious GSW to the right arm in France on 4 October 1917 and was evacuated back to England where he spent time at the Military Hospital at Weymouth (where he was also charged for failing to salute an officer). He was repatriated back to Australia on 5 April 1918 and was discharged from the Army in Melbourne on the 29th September 1918. The Australian electoral rolls show that before his marriage, Fred worked on his father's farm near Lalbert. He and Ethel were at nearby Kunat in 1919 but moved into Swan Hill not long after where Fred worked first as a 'motor garage proprietor' and later a carrier (which his two sons Frederick Edward and Oliver Charles Bish also worked as). Fred died at Swan Hill in 1973. Ethel died there four years later. They are buried together in the local cemetery, their headstone telling us they are the 'loved parents of Rose, Fred, Oliver, Lynnette and Ida'. Their eldest son, Frederick Edward Henry Bish (1921-2008) and his wife Elaine lived and worked at Swan Hill and nearby Dorrington. Frederick died at Swan Hill in 2008, aged 87 years and 'the loved father of Marilyn, Alan (deceased), Graeme, Jenny Andrew and their families' (Herald Sun, 25 September 2008). From the 'Shepherd Family Tree' on Ancestry, the photo on the left is of the children of Edward and Elizabeth Agnes Shepherd nee McKeown in around 1921.
and shows Rex Shepherd with his brother-in-law Edward John ('Ted') Donohue. 'taken for a newspaper article on a win in a cooking competition'. 2) Reginald James Patrick ('Rex') Shepherd (1898-1983). Born at Whycheproof in 1898 Rex grew up at Mumbel Plain where, in 1915, he suffered from a bout of pneumonia which resulted in him being admitted to 'Nurse Keane's private hospital at Ultima' where, the Ulitma and Chillingollah Star informed its readers, 'he was progressing as favourably as can be expected'. Rex was farming land at Meatian when he married Winifred Eileen Donohue (1895-1972) in 1923. Eileen was born at Ninyeunook in Victoria, the daughter of Rodger Donohue (1867-1921) and Bridget Mary McGrath (1866-1927) who were married at Quambatook in 1891 and had five children in addition to Eileen: Edward John, Alice Mary, Johanna Rose, Margaret (who married Rex's brother Edmund Shepherd) and Timothy Michael Donohue. 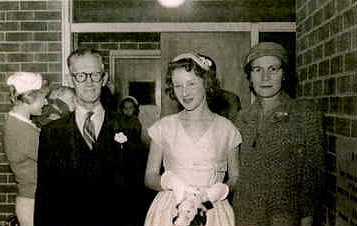 Eileen Shepherd nee Donohue with her eldest son Rodger are pictured below with Eileen's mother and maternal grandfather. The same year he and Eileen were married, Rex suffered a serious work accident. As reported in the Melbourne Argus on 10 July 1923, he 'was feeding a chaff cutter . . . when his hand was dragged into the knives and cut off at the wrist. He was taken to Swan Hill for medical treatment [and] is in a weak state'. 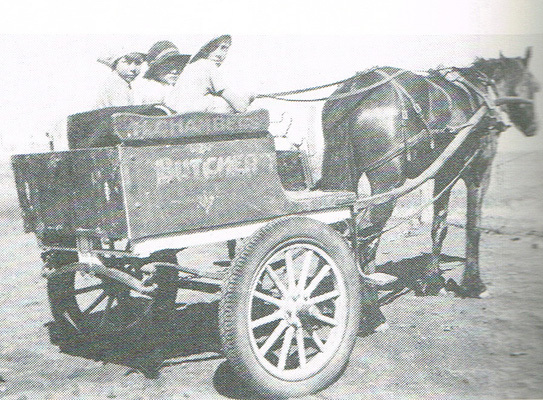 In his autobiography, his future son-in-law, Keith Allingham Greenham, recalls that Rex was taken from Meatian to the hospital at Swan Hill by horse and gig which stopped briefly to change horses at his family home at Goshen. While in hospital, Keith adds, Rex's 'life was saved by a direct blood transfusion from the local Catholic Priest'. This act of kindness, coupled with Rex and Eileen's strong Catholic faith (stemming also, in the latter's case, from her Irish heritage) contributed undoubtedly to their decision, made many years later, to fund the altar for the newly constructed St Michael's Catholic Church at Lalbert. This was officially opened in April 1954 before a crowded congregation by the Bishop of Ballarat, the Most Rev. Dr J. P. O'Collins (Melbourne Advocate, 15 April 1954). The Australian electoral rolls show that Rex and Eileen, along with Rex's younger brother Edmund ('Ted') Shepherd and his wife Margaret, continued to farm at Meatian until 1963 when they left the district to live out their lives at Swan Hill. During their time at Meatian both Rex and his brother were heavily involved in having a primary school established for the Meatian community. Rex also worked for a time for the State Rivers and Water Supply Commission stoking the boilers for the Cannie Pump. This pumped water to a reservoir at Goshen from which water was then distributed via channels to the surrounding farms. The original pump operated between 1903 and 1926 when it was relocated to the Cannie Range where it operated until 1952. Eileen died at Swan Hill in 1972. Rex lived on until 1983. Keith Greenham recalls that following his retirement in the 1970s, 'my father Bert and Rex Shepherd were to be found with others of their generation in Swan Hill's White Swan Hotel having a quiet drink' and, no doubt, discussing the good old days. 2.1) Rodger Edward Shepherd (1924-2005). In a report of the ordination of Catholic Priests in July 1951, the Melbourne Advocate informed us that one of the ordinees was 'the Rev. Rodger E. Shepherd, eldest son of Mr and Mrs R. J. Shepherd of Meatian in Victoria. Educated at Meatian East State School and by the Marist Brothers at Assumption College, Kilmore. To be ordinated by the Most Rev Dr O'Collins in St Patrick's Cathedral, Ballarat, for the diocese of Ballarat'. One of Rodger's first sermons at Ballarat was made on Air Force Commemoration Day where he 'spoke of the importance of the RAAF as a vital unit in the future defence of Australia. Airpower was growing daily', he insisted, 'and it was essential that Australia's air force be ready at all times to answer any emergency' (Advocate, 25 September 1952). Two years later Rodger, who by then was based at Mildura, and five other Assumptionists who had joined the priesthood, attended the Kilmore old Boys 42nd Annual Reunion which began with an informal smoke social and culminated in a college dinner that 'overflowed into the junior refrectory of the college' (Advocate, 10 June 1954). The Ryerson Index shows that Rodger Edward Shepherd, 'late of Horsham' died at Ballarat aged 81 years. He was then the Senior Priest of the Diochese of Ballarat and loving brother of Patrick (dec), Jim, Doreen and Monica. and Bridget's father, John McGrath (1839-1925). SCHIFFERLE - SHEPHERD The marriage of Doreen Bridget, elder daughter of Mr. and Mrs. R. J. Shepherd, Meatian, to Thomas Joseph, youngest son of Mr. M. and the late Mrs. Schifferle, Murraydale, was celebrated, with Nuptial Mass, at St. Mary's Church, Swan Hill, by Rev. J Russell. The bride's brother, Rodger, a Corpus Christi student, was altar boy. The bride, given away by her father, wore a gown of duchess satin, featuring a draped hipline, lace yoke with small satin collar. Her full length veil was mounted with pleated tuille and orange blossom. She carried a bouquet of Christmas lilies and Frangipanni with her ivory missal. She was attended by her sister, Monica, and her cousin, Rosa Stanbrook. Their frocks were lemon georgette, with hand-painted flowers in autumn tonings. Their bouquets also featured autumn tonings. The bridegroom was attended by his brother, Frank, arid Rodger Stapleton was groomsman. Thomas' grandfather, Michael Schifferle, was born at Dottingham in Switzerland and his grandmother, Anne Marie O'Reilly, in Ireland. Thomas' father, also Michael Schifferle (1879-1957), married another woman of irish descent, Margaret Catherine McCabe (1888-1932), at the Catholic Church in Lalbert in 1910. According to the 'Bunton/Watson original tree' on Ancestry, Michael and Margaret 'lived at Kalpienung [near Whycheproff] for a few years and then took up land at Manangatang where Michael cleared mallee roots with the bullock team. Maggie lived in a tent until a home was built'. 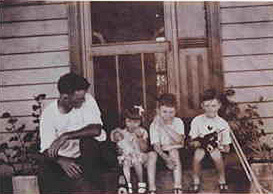 They had at least five children in addition to Thomas: Michael John, Patrick Hugh, Eileen Patricia, Catherine and Dorothy Schifferle. 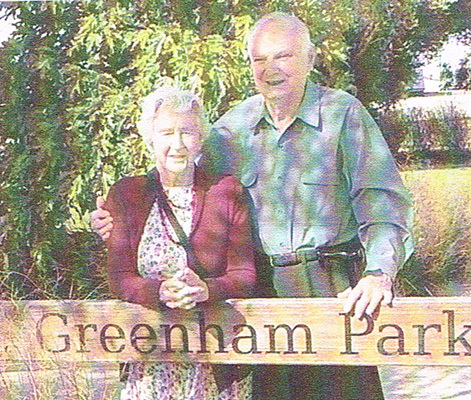 The autobiography written by Doreen's second husband, Keith Allingham Greenham, tells us Tom and Doreen worked as 'share dairy farmers milking 40 cows on the Tyntynder Flats' before purchasing 'a 60-acre farm of their own at Murraydale'. They had four children: Carmel, who obtained a Bachelor of Commerce degree from Melbourne University and worked for a time for the Brotherhood of St Laurence; Rodger, who completed an apprenticeship as a motor mechanic; Danny who tragically died while swimming when he was twelve years old; and Christopher Schifferle who died in infancy. Thomas Joseph Schifferle died of cancer at Murraydale in 1976. After his death, Doreen and her son, Rodger, 'extended and ran the [now] 120-acre dairy farm. She also became a tour guide at Tyntynder Homestead, a volunteer secretary of the Swan Hill Branch of the Victorian Farmers Federation, and a member of the Penguin Club, a public speaking organisation'. Doreen and Keith were married at St Mary's Catholic Church at Swan Hill on 7 February 1987, her brother, Father Rodger Shepherd, conducting the ceremony. She sold the Murraydale dairy herd and later the farm itself and added travel and writing poetry to her growing list of activities (her son Rodger Schifferle, went to Papua New Guinea where, for number of years, he and a workmate operated a commercial fishing boat). In 2010 Keith sold his property at Pental Island and he and Doreen retired to Swan Hill. 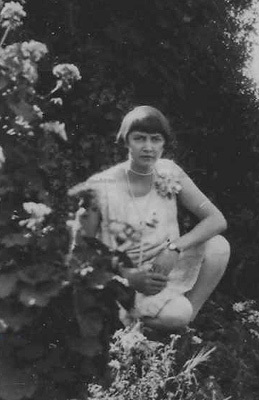 Doreen's aunt, Ida Mary Shepherd later Power, on her 21st birthday on the 16th of October 1928.
. . . was granted to his widow, Idam Mary, and two sons Maurice John Power and William Patrick Power. His will stipulated that his daughter, Norma Elizabeth Holloway, was to receive $10,000 free of all death and statuary duties. The real estate was to go to his son Maurice John Power. The remainder of the estate was to be held in trust and the income derived was for his wife Ida Mary up to her death upon which what remaied was to be divided equally between his sons Maurice and William. William's estate was worth in total $424,711, this included the property consisting of 999 acres . . . in the Parish of Lalbert and a County of Tetchera Crown Grant . . . valued at $328,671. Leila and James Power had two children: 1) Dorothy Power who we believe is married and has two children; and 2) Trevor Thomas Power (1934-84) who, we think, married Mary Scholastica Brennan, daughter of Andrew Brennan (1887-1943) and Robina Rose Spark, in 1960. The 1963 electoral roll shows Trevor and Mary farming at Lalbert. The 1968 and subsequent rolls have them farming at Gunnedah in central New South Wales where, sadly, Trevor died on 8 September 1984, aged just 50 years. The 'Power Family Tree' on Ancestry tells us he and Mary had four boys - Craig John Power (1962-2011) and three others - and two girls, one of whom is probably Jacqui O'Donoghue, head of 'Lively Linseed Products' of Mullaley, located 38 km west of Gunnedah. In an interview with The Northern Leader Daily on 20 October 2016, Jacqui answered the question 'Who do you most admire? ', with 'probably my father, Trevor Power. He passed away at 50 but achieved a lot in that time. He was intelligent and hardworking but he had vision, he was a very successful man and very generous with his knowledge'. The 'Power Family Tree' also informs us that Trevor and Mary's six children have, between them, produced no less than 17 grandchildren (ten boys and seven girls). 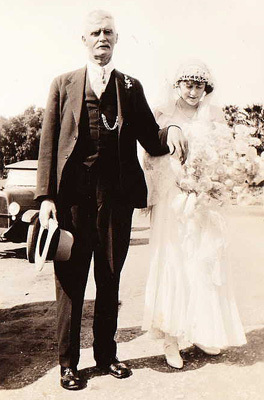 'Holloway Family Tree' on Ancestry and shows William Patrick and Veronica Patricia Power nee Hogan on their wedding day. Pat Power setting off to the Lalbert West State School. 4) Born at Swan Hill, Edmund Shepherd (1905-73) married Margaret Donohue (1900-72) in 1926 probably at Lalbert although that has not been confirmed. Margaret was the younger sister of Winifred Eileen Donohue who, as described above, married Edmund's brother, Rex Shepherd. The Australian electoral rolls show that Edmund and Rex and their respective wives lived and farmed at Meatian until the mid-1960s, in the case of Rex and Eileen, and, for Margaret and Edmund, until their deaths there in 1972 and 1973 (they are buried together in the Lalbert Cemetery). Robert White tells us that Edmund and Margaret had eight children: Marie Bridget (born in 1926), Edward Keith (1928), Ronald Patrick (1929), Elizabeth Rose (1930), John Rex (1931), George Lennox (1932), Beryl Margaret (1935) and Valda Mary Shepherd (1938). We know nothing of Rose and Valda beyond their dates of birth. We believe their brother, George Lennox Shepherd (1932-85), who died and is buried at Lalbert, worked all his life as a farmer and did not marry. Another brother, Ronald Patrick Shepherd, farmed at Meatian until at least the 1980s and died in hospital at Swan Hill in 2000. We have yet to determine whether he married. Unlike his brothers, John Rex Shepherd (1931-68) seems to have worked not as a farmer but a cafe proprietor, at Lalbert until his death at Bendigo in August 1968 (he, too, is buried in the Lalbert cemetery). According to the 'Holloway Family Tree' on Ancestry he did marry and had five children. Altogether, Edmund and Margaret's children provided their parents with more than 25 grandchildren and 48 great grandchildren. Edmund and Margaret's eldest daughter, Marie Bridget Shepherd (1926-2012) married Ronald Joseph Hogan (1923-2017), the youngest son of Michael James Hogan (1888-1979) and Johanna Helena Stakelum (1888-1979) who were married on 19 August 1914 at Donald in Victoria and farmed at Dooboobetic between Donald and Charlton. Johanna's mother, Mary Meagher, was born at Drombane in the County of Tipperary in Ireland and had arrived in Victoria on the sailing ship 'The Trident' in June 1863. She married an Irishman, Pierce Stakelum (1837-1908), three years later and they settled on a 300-acre block of land at East Corack in 1874. Their block, to which Pierce was granted title to in 1895, adjoined that of Dennis Ryan and was not far from land owned by John Shepherd and William Free. Johanna, who was born at Corack, and Michael Hogan had six children in addition to Ron: Leo Pierce, Bernard Mannix, Lawrence Patrick, Valerie, Gregory Francis and one other. The Ryerson Index tells us that Marie Bridget Hogan, 'late of Wycheproof and formerly of Nullawil', died at Bendigo on 14 July 2012. Her obituary, published in the Herald Sun on 16 July 2012, tells us she was the 'Dearly loved and devoted mother of Pamela, Peter, Glenn and Carmel. Fond mother-in-law of Colleen, Kim (dec) and Carolyn. Loved Nana of Diana, Bradley and Luke, Sam, Alexander, Austy and Susannah; Jacob, Zac, Rory and Willem. And their families Julian and Lauren'. Her husband Ron, aged 94 and 'late of Nullawil', died at Whycheproof on 20 October 2017. Edmund and Margaret's eldest son, Edward Keith ('Barney') Shepherd (1928-2007), married Margaret Ellen Cummins (1938-2003). The Australian electoral rolls show them farming land at Ultima in 1963 and at Portland from 1967 until at least the early 1980s. The Ryerson Index shows that an Edward Keith Shepherd, 'formerly of Ultima and Meatian', died at Portland on 2 October 2007. His obituary, published in the Herald Sun on 5 October 2007, tells us he was 'aged 79 years. Loved and devoted husband of Margaret (dec). Cherished father of Noreen, Ted, Garey, Theresa and Bonny. Pop of 12 grandchildren and 4 great grandchildren. Loved son of the late Edmund and Margaret Shepherd of Meatian. Loved brother of Marie, Ronald (dec), Elizabeth, John (dec), George (dec), Beryl and Valda'. Margaret had died at Portland in 2003. Beryl Margaret Shepherd (1935-2016) married Leonard John Dillon, a farmer from Wycheproof in Victoria. 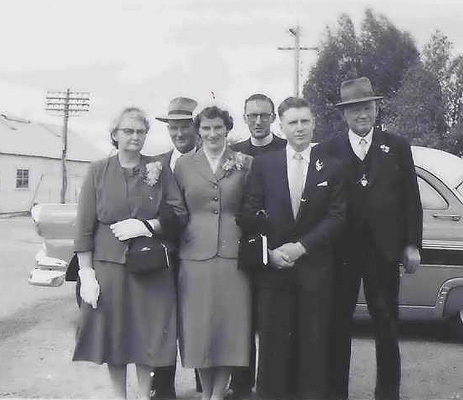 Although still to be confirmed, we think Leonard's parents were Roger Aloysius Dillon (1900-91) and Kathleen Bridget O'Keefe (1901-80) who, according to the 'O'dea4_2012-04-10' family tree on Ancestry were married at Birchip in central Victoria in February 1923. Len and Beryl lived all of the their married ives at Wycheproof where Len was born and later farmed land there with his father and brothers. Both Len and Beryl died at Wycheproof, he in 2006 and she ten years later. Beryl's obituary, published in the Herald Sun on 1 March 2016, tells us she was 'aged 80 years. Beloved wife of the late Len. Loved and devoted mother of Josie (Lowerson), Max, Carlene (Mortensen), Angela (Agosta), Glenda (Bish), Rod, Jeff, Shirlene, Terry, Laurie and Lorena (Kelly). Fond mother-in-law of Taddy, Stephen, Angelo, Darty, Donna and Gene. Loved Nanna of 25 grandchildren. Loved Nanna D of 7 great grand daughters'. 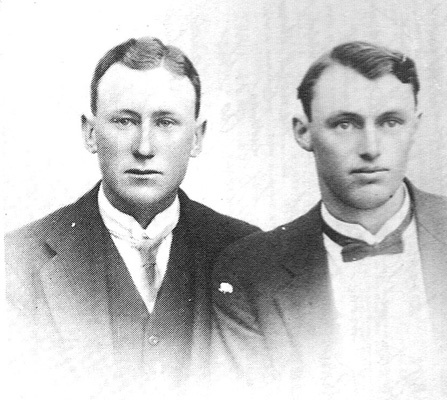 and three of their children (L/R): Lawrence Patrick, Leo Pierce and Bernard Mannix Hogan. (third from the right in the rear row). general and sincere regret was expressed at the death on Saturday evening at the Wycheproof Hospital of Mrs Louisa Shepherd, wife of Mr T. Shepherd, of Wycheproof, and daughter of Mr and Mrs W. Shepherd of St Arnaud. The deceased had been suffering from anaemia for some time, and was admitted to the Wycheproof Hospital about ten days prior to her death. Despite the medical and nursing care she did not improve and was unconscious for two days. Deceased who was born at Gowar (near St Arnaud) was 41 years of age and was married about three years ago. She leaves a husband and two little boys (Rowland and Edward) to mourn their loss and family. The funeral to the Wycheproof Cemetery on Tuesday was largely attended. Father Gleeson conducted the burial service. The Australian electoral rolls show that, after Louisa's death, Thomas continued to live and work (as a labourer) at Wycheproof until just after 1925 when he moved to Dumosa and lived with Louisa's brother, John William Shepherd (1874-1955) and his family. The Australian burial records on Ancestry show that Thomas Chaffe Shepherd, aged 76, died at Wycheproof on 4 July 1945 and was buried in the local cemetery. The 'Shepherd Family Tree' on Ancestry tells us that Thomas and Louisa had three children: 1) Nellie May Shepherd, who was born at Coonooer East in 1911 and died at the Melbourne suburb of Parkville in 1959, and married Robert Henry Saw at Ballarat on 16 September 1939. She and Robert were said to have had a daughter, Valerie June Saw (1940-44); 2) Rowland John Shepherd, born at Wycheproof on 16 November 1916; and 3) Edward Lynn Shepherd (Roland's twin brother) who died at Mount Magnet in Western Australia in 1935). It should be noted that there are a number of complexities and uncertainties associated with the records for each of the children: 1) We have yet to find find any registered record of Nellie's birth and that of her death, contained on Victoria's Births, Deaths and Marriages website, tells us her parents were unknown. 2) while Ancestry's index of Australian bdms confirms that a Rowland John Shepherd was born in Victoria in 1916, we have yet to find any evidence, beyond Louisa's obituary, of his subsequent existence. 3) We have yet to find any formal record of the birth of Rowland's brother, Edward. We also think it likely that the Edward Shepherd who died at Mount Margaret in Western Australia was an infant not an adult. This is based on the following entry, located in the WA Library's 'Outback Family History' website, for burials in the Leonora/Mount Margaret Cemetery: 'SHEPHERD-Edward-17/01/1935-Mt Margaret 4/1935-1 day-Leonora-Leonora-RC'. We further think this Edward was probably the son of Edward Lillington Shepherd who was born in Adelaide in 1895 and married a former Victorian, Alma Alice Irving, at Mount Margaret in 1934.
is of the town's 'Broadway' in 1922. Also born at Donald, Bob married Mary Frances Gibbons (1879-1976) at Swan Hill in Victoria in 1902. Although still to be confirmed, we think Mary's parents were James Gibbons and Catherine Kemp who were married in Victoria in 1876. The Australian electoral rolls show that Bob, who worked for the railways, and Mary spent much of their married life at Bendigo where he died in 1934 and she in 1976. They are buried together in the Bendigo Cemetery (Grave no 29911). The electoral rolls and other sources indicate they had eight children: Edward John (1903-96), Thyrzal Matilda (1905-90), Bertha (1906-2002), Robert James (1907-82), Henry ('Harry') Joseph (1909-2001), Leo Thomas (1911-99), Margaret Josephine (1914-92) and William Patrick ('Bill') Shepherd (1916-45). According to the Department of Veterans Affairs' nominal roll, Bob and Mary's four youngest boys all served in the Australian Army during the Second World War. Robert jnr enlisted at Merauke in Dutch New Guinea in August 1943 and served with the Army Ordnance Corps until September 1944. Leo was said to have enlisted at Maryborough in Victoria in March 1941 but no details are provided about his subsequent service. Their brother, Harry, enlisted at Milne Bay in New Guinea in February 1944 and served as a Craftsman with 9 Australian Water Craft Workshop until 18 December 1945. 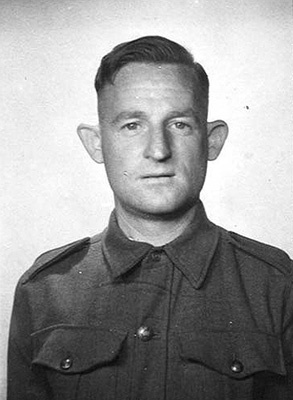 Bob and Mary's youngest son, Bill Shepherd (pictured below), first enlisted at Bendigo on 16 August 1940 and was allocated to the Australian Army Service Corps. He was discharged on 26 November 1941 and re-enlisted at Royal Park in Melbourne on the same day. He was allocated to the 2/10th Ordnance Workshop Company which sailed from Sydney for Singapore in April 1942. Not long after their arrival, his unit was forced to surrender to the Japanese and Bob spent the remainder of his time as a prisoner of war. He died from malaria in Borneo on 5 June 1945 (his mother wasn't officially informed of his death until January the following year). Bob's body was never recovered for re-burial after the war so his name is memorialised on the Labuan Memorial (Panel 30).
. . . to the strains of Mendelssohn's Wedding March . . . Her frock of white satin and lace was cut on simple lines . . . a hand embroidered tulle veil was arranged cap fashion and held in place by a coronet of orange blossom . . . and a beautiful bouquet of white camellias, roses and heather was carried. The bride was attended by Miss Sheila Doherty as bridesmaid . . . The bridegroom was supported by his brother (Mr. Bob Shepherd) as best man. After the ceremony, a reception was held in the Soldiers' Hall, where about 60 guests were entertained . . . Mr. M. H. Harben acted as chairman and opened the proceeding with the toast of 'The King' . . . In his toast of the bride and bridegroom, Rev. Father Killian said it gave him unqualified pleasure to be present on this happy occasion to pay tribute to a bride who was 'a packet of gold' . . . [in toasting the bride's parents, a Mr D. J. Anderson declared he] had known Mr. and Mrs. Eastwood ever since their arrival in Balranald and felt justified in saying that they were most worthy townspeople. . . . found on committees of various organisations . . . and always to the fore in the interests of charity and church . . . . At the conclusion of the evening all joined hands and sang 'Auld Lang Syne' . . . Amid showers of confetti and good wishes the happy couple left on their honeymoon, which will be spent in Geelong and Melbourne (Riverina Recorder, 22 July 1933). Born at Mildura on the Murray River in 1910, Isabella was the eldest daughter of a railway worker, Henry Stephen Eastwood (1880-1953), and Catherine McLarty (1883-1955) who were married there the previous year. 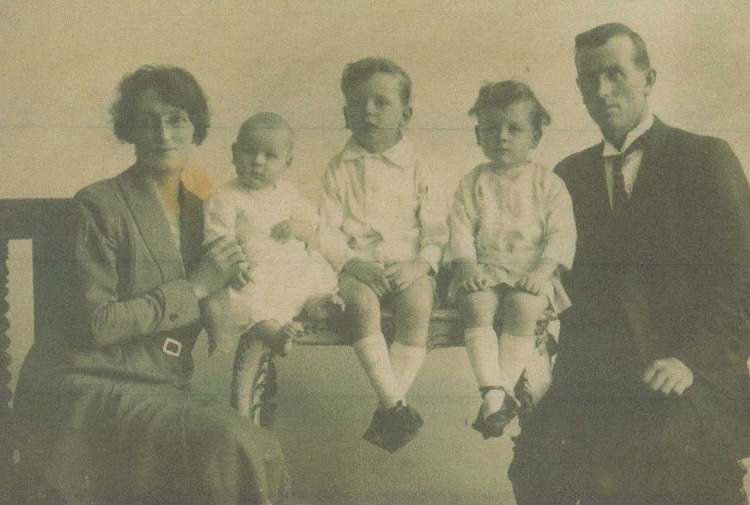 They had four children in addition to Isabella: Norman Henry Stephen Eastwood (1911-80), Clarence Archibald McClarty Eastwood (1913-85), Victor Sydney Hamilton Eastwood (born at Lake Boga in 1915) and one other. The Department of Veterans Affair's nominal roll shows that Clarence and Victor both served in the Australian Army during the Second World War, Clarence from July 1941 to December 1945, at which time he was a Private in the 13th Australian General Hospital, and Victor from February 1943 to June 1946 when he was a Private in 4 Field Ambulance. Catherine's parents were a Scotsman, Archibald McClarty (c1835-1929) and Margaret Jane Bates (1848-1924) who was born at Penshurst in Victoria. Henry Stephen's father, Henry Eastwood, hailed from Belfast in Northern Ireland. His mother was Amelia ('Minnie') Barnes who was a South Australian by birth. The Australian electoral rolls show that Henry Stephen and Catherine and their family spent time in Gippsland - at Loch and nearby Nyora - before moving to Balranald, and, after the war, ran an orchard at Nyah West near Swan Hill where Henry died in 1953 and Catherine two years later. The electoral rolls show that Edward John Shepherd also worked for the Victorian railways and he and Isabella lived initially at Mincha near Rochester and then Tresco near Swan Hill before, in the late 1950s, moving to Melbourne where they first lived at Syndal and later Mount Waverley. They went back to Swan Hill after Edward retired. He died there in 1993 and Isabella in 1996. They had four children we know of: Robert Henry John Shepherd (1936-80), a mechanic by trade, who married Faye Lynette Evans; Edmund Thomas Shepherd, also a mechanic, who, with his wife Janice Marlene, a teacher, lived at Mount Waverley until around 1980; Catherine Shepherd; and William Shepherd who was working as a woolclasser in the 1970s. 2) Born at Wycheproof, Thyrzal Matilda Shepherd (1905-90) married Sidney Leonard Edwards (1900-69) in Victoria in 1927. Sidney was born at Eaglehawk, the fifth child of Edward John Edwards (1869-1923) and Mary Ann Pullen (1870-1954). Edward had been born at the gold-rush town of Maldon in central Victoria. His parents were an Englishman, Harry Edwards (1841-1903), and a South Australian Evelyn Crowhurst (1848-1917). The UK 1881 census shows that Harry and Evelyn and their family had returned to England in around 1876 and were living at Brighton in Sussex (Harry's birthplace and where he was then working as a carpenter). It seems, for Harry at least, the lure of gold mining remained very strong and they returned to Victoria a few years later. Harry died at Coolgardie in Western Australia in 1903. 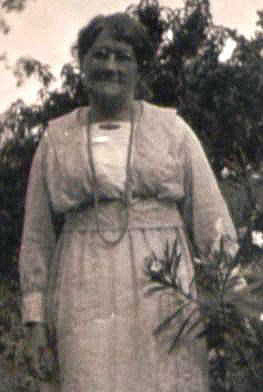 Evelyn died at Bendigo, where most of her family lived, in 1917. A report in the Bendigo Advertiser tells us her 'funeral, which was attended by many friends, moved from the residence of her son, Mr. Richard Edwards, 23 Horace-street, Quarry Hill . . . and the coffin was borne to the grave by Messrs. R. Edwards, E. J. Edwards, W. Edwards (sons), and W. Crowste (nephew)' (6 July 1917). According to 'Mel's family Tree' on Ancestry, Edward married Mary Ann Pullen at Brighton in Sussex on 21 August 1888. Mary Ann had been born there in 1870, the daughter of William Pullen (1847-1931) and Sarah Elizabeth Cornell (1849-1919). Edward and Mary Ann's first two children - John William (1889-1917) and Lily (1890-1946) were born at Brighton. Their next eight children were all born in Australia: Percy Alfred (1894-1918), William Charles (1898-1987), Sidney Leonard (1900-69), Louisa (1902-90), Sylvie Elizabeth May (1909-26), Phyllis Mary (1911-2002) and Edward Albert Edwards (1914-95). Two of Sidney's brothers, John and Percy Edwards, served as private soldiers in the 1st AIF's 57th Battalion during the First World War. Both were killed in action, John at Polygon Wood in Belgium in September 1917 and Percy near Picardie in France in August 1918. The Australian electoral rolls show that Sidney was a plasterer by trade and that he and Thyrzal lived at Bendigo from the time of their marriage until the beginning of the Second World War when they moved to Melbourne. The Department of Veterans Affair's WW2 nominal roll shows that Sidney enlisted in the RAAF at Melbourne on 12 October 1942. He was then living at East Brighton and gave Thyrzal as his NOK. He was discharged on 20 November 1945 at which time he was a Leading Aircraftman at 1 Central Reserve. He and Thryzal continued to live in Melbourne after the war, initially at Elsternwick and then Bentleigh where Sidney died in 1969. The Springvale Botanical Cemetery records show that Sidney was cremated there on 2 April 1969 (Cassia, Wall ZO, Niche 63) and Thyrzal Matilda Edwards died on 22 October 1990 and was cremated at Springvale four days later (Cassia Wall ZO, Niche 69). We believe Thyrzal and Sidney had had one daughter, Joyce Constance Mary Edwards who married a plumber, Keith Gaunt Newell, in 1949. The DVA's WW2 nominal roll tells us Keith was born at Murrumbeena in Melbourne in 1926, the son of Amrose Keith Newell, and served in the RAAF from February 1944 until November 1945 at which time he was a Leading Aircraftman at 12 Aircraft Repair Depot. The electoral rolls show he and Joyce lived at Bentleigh until at least the 1980s and had at least one child, Raymond Keith Newell, who was working as an apprentice in 1977 and 1980. 3) Henry Joseph ('Harry') Shepherd (1909-2001) married Hazel May Bryar in 1931. Born at Bendigo, Hazel was the eldest daughter of Phillip Henry Bryar (1886-1926) and Florence May Lowther (1894-1951) who were married at Bendigo in 1912. According to the 'Rudge Family Tree' on Ancestry, Phillip, who worked as a miner, and Florence had nine children in addition to Hazel: Phillip James Edwin (1914-99), Lillian Phillis (1915-92), Eva Annie (1917-66), Phyllis Irene (1919-88), Harold Richard (1921-98), Dorothy Jean (1923-2011), Sydney Francis (1925-91) and two other girls. Phillip died at Bendigo in 1926 and Florence re-married in 1931, to a Charles Brazel/Brazil Cole (1908-83). Florence died in 1951 and is buried in the Bendigo cemetery. Phillip's grandparents (Hazel's great grandparents) were Thomas Bawden/Bowden Bryar (1831-1908) and Mary Ann Roberts Burgess (1828-85) who were married in Cornwall in 1851 and emigrated to South Australia in around 1857. In around 1868 the family moved to Victoria where Thomas had selected land at Carag Carag near Stanhope. They later moved to Bendigo where Thomas again worked as a miner probably at the Specimen Hill gold mine. He and Mary Ann were living at Eaglehawk at the time of Mary Ann's death in 1885. Thomas, who we think had re-married and was then living at Long Gully, died at Specimen Hill in 1908. Apart from the two years he served in the Australian Army during the Second World War, Harry Shepherd spent all of his adult life at Bendigo where he worked as a labourer and blacksmith. The Australian electoral rolls show he and Hazel were at 237 Barnard Street until the mid-1950s when they moved to the suburb of Eaglehawk. The Bendigo Cemeteries Trust website informs us that Harry died at Eaglehawk 1 June 2001 and is buried in the Eaglehawk cemetery (Lawn N Grave 42). Hazel had died there in 1978 and is buried in the same grave. They had one son we are aware of: John Henry Shepherd, who was working as an apprentice in the mid-1970s and, we believe, married Cheryl Ann Watson. The photo on the left is from the Australian War Memorial and is of VX66586 Pte William Patrick Shepherd (1916-45). Phoebe Emily Moore nee Shepherd (1873-1909). According to Robert White, Phoebe married Charlie Moore and had three children: 1) Mary Moore who married James Barker and had ten children; 2) Edward Moore who married Matilda Smith and had three children; and 3) John Moore who married Veronica Mary Smith and had one child. John Finlay William ('Jack') Shepherd (1875-1933), then a farmer of Mumble Plain near Lalbert, married Ada Jane Fidge (1886-1974) at Swan Hill in Victoria in 1905. Ada was born at Dowlingville in South Australia, the third daughter of Edward Fidge (1854-1929) and Tryphena Pridham (1861-1943) who were married at Crystal Brook in the Clare district of the State in 1878 (Tryphena is pictured on the left not long before her death at Condobolin in 1943). The 'Elliott/Brimelow Family Tree' on Ancestry tells us that Tryphena's parents both hailed from Devon whereas those of Edward Fidge came from Kent and Cornwall. Edward and Tryphena had twelve children in addition to Ada: Elsie May, Albert Harold Pridham, Alfred Edward, Minnie Tryphena, Hilda Alice (who married Richard Colmer Smith, son of Joseph Colmer Smith and Rebecca Hickmott, at Lalbert in Victoria in 1909), Percy Lithgow, Winifred Victoria, Florence Ivy, Ethel Ida, Gladys Frances Lillian and Wilfred Fidge. In 1891 the family left South Australia for Victoria where they settled on land at Meatian near Lalbert. They sold up in 1910 and, after a year at Bendigo, went to Condobolin in central NSW. There Edward purchased several farming blocks on the old Potters Mine property north of the town and, as his obituary tells us, became 'one of the most successful farmers in this district'. Mr Jack Findlay Shepherd was killed on the Parkes Road, just near the old show ground, when on his way to the Experiment Farm where he was employed. It appears that about 6.30 a.m., deceased left his home and was riding his cycle along the Parkes Road. A motor car in which were two brothers, Arthur and Henry Moon, of Bondi and Parramatta, travelling in the same direction, and their destination being Sydney. Sounding the horn of the car, deceased, we understand, veered to the right of the road and came in contact with the car, and was killed instantly. Seeing the plight of the unfortunate man, one brother remained with him, whilst the other came back to town to seek police and medical aid. Deceased's son, George, left home some ten minutes later than his father, and was on his way to to work, also at the Experiment Farm. He came across the huddled form of a man lying on the road, and with Mr Moon standing by. George was horrified to see the dead man was his father. It also appears that deceased had some distance back, passed the two Moon brothers on the road when they were pumping up a flat tyre, and had bid them good morning. About a mile further on, the tragedy occurred. An inquest is to be held next Monday at the Condobolin Court house. The news greatly shocked everyone here, as the late Mr Shepherd was so well known, For twenty years he has been a resident of Condobolin and for the greater portion of that time was employed at the Experiment Farm. He was a native of Victoria. Deceased is survived by his widow, one daughter, (Phyllis) Mrs. Howard, and four sons, George, Norman, Eddie and Gordon. The funeral took place on Wednesday afternoon after a service in the Roman Catholic Church. Rev. J. O'Brien officiated at that service, also at the graveside (Lachlander and Condobolin and Western Districts Recorder, 25 August 1938). Ada continued to live at Condobolin after Jack's death. During the period of the Second World War, as well as worry about her two sons who were serving in Australia's Armed Forces (see below), she had also to deal with the death of her beloved mother who 'passed away peacefully, in the Condobolin District Hospital, on the night of Sunday 21st November, at the ripe old age of 83'. 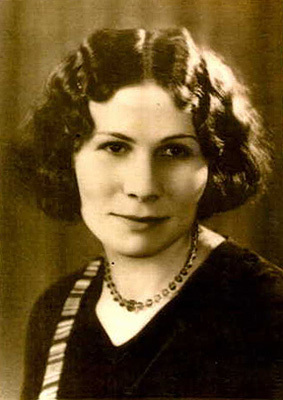 Tryphena's obituary described her as a 'woman of the best motherly type and possessing the notable charitable characteristics of the old pioneering type'. It added that her surviving family then comprised: 'Elsie (Mrs Denton), of Bendigo; Minnie (Mrs. Nioa), Melbourne; Ada (Mrs. Stepherd), Condobolin; Hilda (Mrs Smith), Melbourne; Linda (Mrs. Duffy), Condobolin; Winnie (Mrs. Tyler), Melbourne; Ivy (Mrs. Molier), Melbourne; Ethel (Mrs. Worthington), Condobolin; Gladys, Condobolin; Albert, Narembeen, W.A., Winifred, Condobolin. A living sister is Mrs. Petersen, Perth, W, A, and one living brother is John Pridham, of Crystal Brook, S.A'. (Lachlander and Condobolin and Western Districts Recorder, 9 December 1943). A very pretty but quiet wedding was solemnised in All Saints' Church, Condobolin, on Monday, 2nd April, when Mary Ann, eldest daughter of Mr. and Mrs. Bradford, of Newcastle, was married to John Norman, eldest son of Mr and Mrs. J. H. Shepherd, of Condobolin. Rev. W. C. Arnold officiated. The bride wore a frock of blue moracain and silver lame and white picture hat with which she carried a beautiful bouquet of pink and white roses and fern, tied with streamers to match. Mrs. George Shepherd, matron ot honour, chose a pink floral frock and white hat. Her flowers were also pink and white roses. Mr. George Howarth was best man. After the ceremony a reception was heeld at the home of the bridegroom's parents, Mrs. Shepherd receiving the guests in a floral crepe de chene frock. Molly was born at South Shield, a coastal town at the mouth of the River Tyne in the County of Durham. Her parents were Wrightson Bradford (1879-1960) and Barbara Hunter (1881-1943), both Durham-born, who were married at Sunderland in 1906. His military record, accessed through Ancestry, shows that the young Wrightson served for ten years in the British Army, initially with the 3rd Durham Light Infantry and then the Royal Artillery. His service included tours of duty in Ireland and South Africa during the Boer War. He returned to the colours with the onset the First World War, again serving in the Royal Artillery. The 'Metcalf-Trueman' Family Tree on Ancestry tells us that he and Barbara had six children: Wrightson jnr, Mary Ann, Norah, Mabel, Joseph William (1913-59) and Eva Bradford (1920-39). We know that Wrightson travelled to Australia in 1922 but are unsure when Barbara and their children arrived. The electoral rolls show they resided at Wallsend in Newcastle in Australia where both Wrightsons worked as labourers. The Department of Veterans Affairs' WW2 nominal roll shows NX2111 Wrightson Bradford, born at Sunderland on 16 August 1908, enlisted in the Australian Army at Paddington in Sydney on 23 May 1940. His place of residence was Wallsend and his NOK was is father. He was discharged on 30 January 1945 at which time he was serving as a Bombardier in the 7th Division's 2/5 Field Artillery Regiment. The 1937 electoral roll has John Norman and Mary Ann Shepherd living with John's parents on Parkes Road in Condobolin NSW. The post-war electoral rolls shows them living on Queen St in Warner's Bay near Charlestown in NSW before moving to Newcastle where John died in 1980 and Molly in 2001. They had one daughter, Newcastle-born Barbara Shepherd (1941-88) who married Walter Gerhard Raub (1935-2006), who was born at Herigen, Hersfeld-Rotenburg in Hessen in Germany, son of Valentin Raub (1895-1963) and Maria Therese Gruber (1896-1947). Barbara died in Newcastle in 1988. The Ryerson Index shows Walter Gerhard Raub, 70 and 'late of Maryland and formerly of Wallsend Newcastle NSW', died on 14 August 2006. The 'Raub Family Tree' on Ancestry tells us Gerhard and Barbara had three children - two girls and a boy, all of whom are married. The two girls, between them, have six children. From the 'White Family Tree' on Ancestry, John Norman and Mary Ann ('Molly') Shepherd nee Bradford. John and Molly with their daughter Barbara Raub. 2) Born at Bendigo, Vivian George Shepherd (1911-89) grew up in Condobolin where he worked with his father at the experimental farm and participated in a number of sports including road cycling and swimming. In 1934 he married a local girl Daphne Juanita Donley (1912-99). 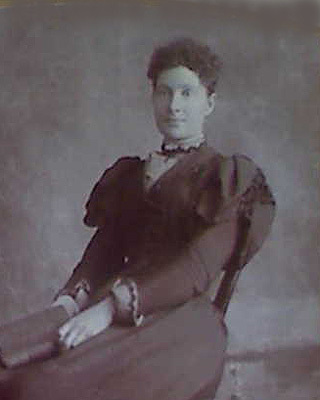 Daphne was the second youngest child of James Bartlett Donley (1860-1960) and Sarah Leahourne Appleby (1874-1946) who were married at Condobolin in 1890 and had seven children in addition to Daphne: Amelia, James bartlett, Vera Sarah, George Sylvester, Anthony Bernard, Mary Kathleen and Dorothea May Donley. Daphne's maternal grandfather, George Appleby, was born in Yorkshire in England and arrived at Sydney just prior to the wreck of the Dunbar. Her mother, Sarah Appleby, came to Condobolin when she was eight years of age. Her obituary tells us Sarah 'was a life member of the Condobolin District Hospital . 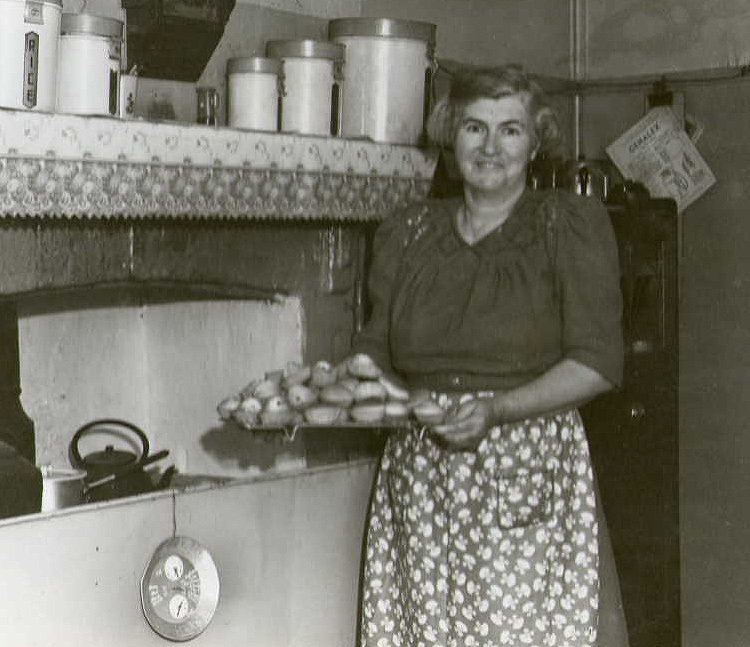 . . a noted exhibitor of cookery items in every Condobolin Show over a period of many years [and a] noted euchre player (Lachlander and Condobolin and Western Districts Recorder, 8 July 1946). I suppose you will be surprised to receive a note from me. But I thought you would like to know I am enjoying myself immensely and recommend the place for excitement, It's hotter than hell and is alive with flies and mosquitoes. The flies eat your food if you are not quick and the mosquitoes and Japs dive bomb you. These bombings make your hair curl, and your heart beats -like Charlie Black's hammers striking the anvil. You grovel in the dirt at the bottom of your trench and listen to the drone as it approaches, nearer and nearer. Someone tries to crack a joke and everyone laughs or rather makes some kind of a noise. We wait then as the bombs start on their trip, whish, whish, whish. You have time to think over your dear ones then the explosions start. The earth shakes and you keep in time by shaking also. You look around at each other and heave a sigh of relief. Then someones shouts here come six or seven more. More wishing and, ex ploding and so it goes on. The all clear siren is sweet music and we climb out and each and every one admits what a scare he got. So really it's quite a nice place for any one who wishes to run away from his wife and kids. There are no white people here excepting army and airmen. We have no lights after 7 p.m. and everything goes on each day. Sunday is no different to Monday. Work seven days a week and try and sleep seven nights if you arc not in your trench. It's very lonely here and the food is plain, no luxuries. We can get a bit of stuff at the canteen when we have the money. I have met no one from Condo yet. I have had no mail from anyone since I left two weeks ago, and am a little worried. I travelled by train to Cairns and flew to Moresby. If the people down there would only realise what it is like to have 500 lb. bombs dropped at them they would pluck up a bit of courage and get up here and try and keep them away from their loved ones. I'd just hate to see what the people down there would do in a raid. The Japs drop eggs on the buildings making everyone scatter then they drop a bomb which we call a daisy-cutter, as it breaks up and flies for hundreds of yards and it will cut down every thing which is around. It will go through thick steel or a tree, so unless you are underground you haven't a chance. We are a pretty happy mob here only everyone misses their homes and families. There is little Which grows here, excepting cocoanuts and they are so high up we need a Spitfire to get to them. Hoping this finds everyone in the best of health as I am fine (published on 16 March 1942). Here comes one of Hitler's toys, pilotless planes. They are great little gadgets - while their engine keeps running smoothly - but as soon as the thing starts to splutter it's time to duck. Quite a few have landed in this locality, and the house has had all its windows smashed for the second time since I arrived here. But I like them more than a Jap 'Kawanishi' on a cloudy night. Most of the pilotless planes travel on a course which takes them over the top of here, fortunately they have enough juice to take them quite a distance before they pop . . . The Boomerang Club is a section of Australia House in the Strand, and is run voluntarily by ladies of London. They are very good to us and it would be impossible for R.A.A.F. personnel to visit London if it were not for this club. We get our meals there half price and it is our meeting place . . . Mrs Duncan, the Deputy High Commissioner's wife, is at the Club four times a week and always gives us a great welcome. Mrs. John Curtin had a chat to us last month . . . One sight. I cannot get used to is the people sleeping in the tube stations. Tiny babies, little girls eating their breakfast of plain bread with a little lard or margarine. I saw a young woman with two little boys and a baby sleeping on the hard concrete at Green Park Station. One of the boys was asleep with his eyes partly open. His nerves were so ragged that periodically his whole body would twitch and shiver until his mother calmed him down again. After leaving the RAAF in 1946, George bought a tract of land in the former Richlands Estate near the town of Taralga which is located some 40 kilometres north of Goulburn. Acquired in the 1820s and some 38,000 acres in size, Richlands was an extension of the McArthur family's pastoral holdings at Cambden. It was resumed by the NSW Government in 1908 and broken up for closer settlement two years later. In August 1947 the Goulburn Evening Post reported that George made local 'farming history' when he took delivery of 'a new type McCormick-Deering cultivator drill with spring time and automatic spring release - the first of its type in the Goulburn district . . . as well as a new type Formal M tractor'. A month later the same newspaper told its readers that while riding with his father on the new tractor, their son John 'slipped off and the wheel of the tractor passed over his leg above the knee, causing a serious break'. Whether or not in response to this unfortunate event, George sold up in 1950 and tried his hand at dairy farming on the Kameruka estate near Bega. This, too, was short-lived and they again moved, first, to Cambden where George was a storekeeper on the Oaks estate and, in 1958, to Thirlmere near Picton where George and his son worked as coal miners. George remained at Thirlmere until his death there in 1989. Daphne, who seems to have separated from George in around 1972, moved to Picton where she died in 1999. Coincidently or not, 1972 was also the year in which George and Daphne's son, John Barry Shepherd, aged just 31 years, was killed in an accident. His death notice, published in the Sydney Morning Herald on 26 August of that year, tells us he was the 'loving husband of Gwen and loved father of Geoffrey, Barry and Deborah, fond son of Mrs G. Shepherd of Picton, and brother of Beverly and Berice, son-in-law of Mr and Mrs K. Davies, brother-in-law of Keith and Barbara'. 3) Jack and Ada's youngest daughter, Phyllis Matilda Shepherd (1913-2004) married George Stanley Howarth (1910-68), at Condobolin in 1933. According to Lynne O'Donnell's 'Steedman Family Tree' on Ancestry, George's parents were Thomas William Howarth (1876-1944) and Sarah Ann Weekes (1877-1959) who were married at St Johns Church at Bolong in Crookwell on 7 March 1903 and lived at nearby Laggan for most of their lives. They had nine children in addition to George: Lila Jane (1898-1976), Thomas William (1901-54), James (1903-71), Blanche Elizabeth (1905-77), Margaret (1906-6), Michael John (1908-26), Frances Clarence (1912-76), Herbert Arthur (1916-95) and Thelma Mary Howarth (1916-50). Lynne also informs us that George's paternal grandparents, George Thomas Howarth (1851-1939) and Elizabeth Marmont (1856-1940), were both of convict stock. George Thomas' grandfather, George Howarth (1779-1847), who was born at Oldham in Lancashire, was transported to Sydney in 1816 instead of being hanged for burglary. Elizabeth's father, William Marmont (1804-66), who was born at Stroud in Gloucestershire, was arrested for housebreaking in 1823 and transported on the sailing ship the COUNTESS of HARCOURT the following year. On arrival at Sydney, he was assigned to work for James Macarthur on the family's Richlands estate. After being granted a conditional pardon in 1839, William married (twice) and, in 1850, purchased 22 acres of land on the Bolong River. After their marriage, George and Phyllis lived at Laggan where George's family then resided, and where George was working as a labourer at Spring Swamp. 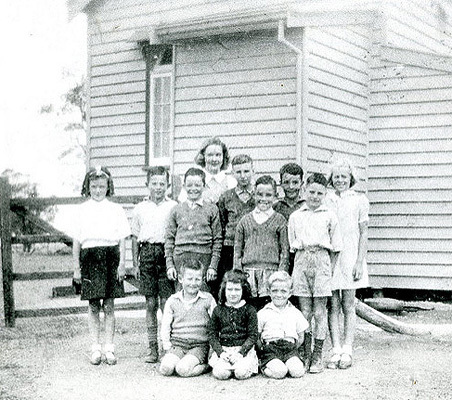 After George's death at Laggan in 1968, Phyllis moved to nearby Crookwell. The Ryerson index shows a Phyllis Matilda Howarth, 91 and 'late of Tuncurry, [and] formerly of Laggan and Crookwell', died at Taree Hospital on 12 December 2004 (Crookwell Gazette, 16 December 2004). Although still to be confirmed, we believe she and George are buried together in the Crookwell cemetery and that they had two girls - Jeanette ('Jenny') M. Howarth, born at Condobolin in 1934, and Marlene Shirley Howarth (1936, Crookwell) - both of whom are married and have provided Phyllis and George with a total of ten grandchildren.
. . . a very pleasant social evening was spent at the local Railway Station last Saturday, the occasion being to bid farewell to Mr. Gordon Shepherd, of the local Railway staff, who has been transferred and promoted to Dubbo. There were about thirty present, including many prominent local citizens. Mr. Chapman, (Station Master), occupied the chair, and opened the proceedings by proposing the toast to The King. After this he spoke very highly of Mr. Shepherd as a Railway employee and congratulated him on his promotion to Dubbo. He went on to say that although Mr. Shepherd had taken the first step up the ladder he had a long way to go, but felt quite sure that he would not be long in getting to the top, as he was very anxious to get along in the service and had already been successful in passing various examinations to fit himself for higher and more responsible positions. He wished Mr Shepherd all the best in his new position. Other speakers ably supporting the chairman, were Messrs. Mallion, McDonald, Oxley. and Gopeland (Railways), Hay and Townsend (Carriers), Martin and Evans (Business), all of whom spoke in glowing terms of Mr Shepherd as a Railway employee and congratulated him on his promotion. Musical items were rendered by N. McDonald, 'Pop' Hay, G. Townsend, D. Oxley, G. Madden. and R. Chapman. During the evening a yarn competition was held, and, after a very close contest, was won by N. McDonald, 'Pop' Hay running into second place. Mr. Mallion, on behalf of Mr. Shepherd's work mates and many friends, presented him with a very nice fountain pen as token of esteem and at the same time, wished him the best in his new position. Mr. Shepherd suitably responded and thanked the various speakers for the nice things said of him and also for the nice presentation. He hoped it would not be long before he would be able to come back to the old town and see them all again. The evening closed with the singing of 'Auld iLang Syne'. It seems Gordon did not return to his birthplace exept, probably, for bouts of holidays. 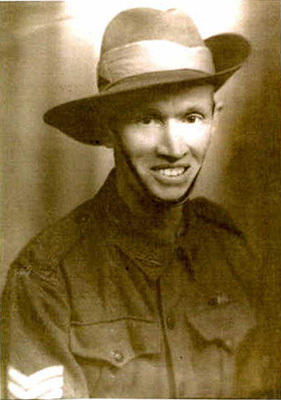 The Australian electoral rolls show that he served as assistant station master (ASM) at Nambucca after his stint at Dubbo and then moved to Sydney where he married Margaret Lillian Healey in 1949. The married couple were living with Gordon's mother at Warners Bay in Charlestown at the time of the 1954 and 1958 elections and, for at least the next two decades, on Ellengowan Crescent in Fairy Meadow, a northern suburb of Woollongong. Gordon seems to have remained working for the railways throughout this time. The death notices in the Illawarra Mercury tell us that Margaret passed away peacefully after a short illness surrounded by loving family on September 19, 2015. She was the 'beloved wife of Gordon. Dearly loved mother and mother-in-law of John and Annie, Peter and Anne, and Marienne. Loving sister of Geoffrey. Cherished aunt of all her nieces and nephews' (24 September 2015). 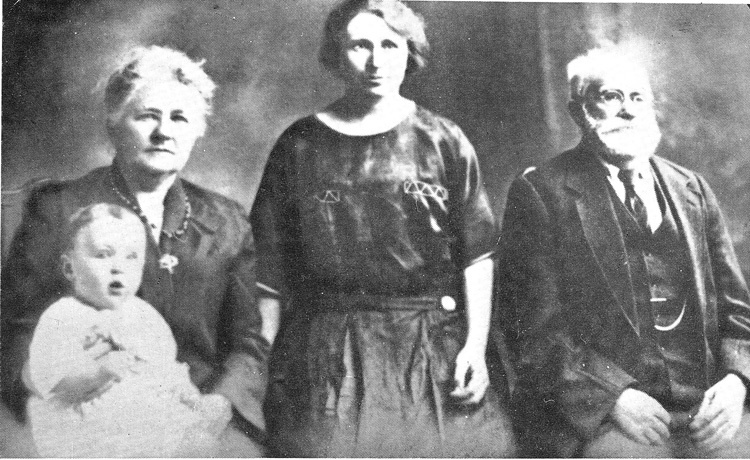 Matilda Catherine Whelan, and her descendants.